Yesterday was a full day of photography for me alone at Fort DeSoto with lots of image processing during my midday break. And answering a few e-mails. But I am still miles behind. This blog post, the 325th in a row, took me about 2 1/2 hours to prepare including the time spent on the four image optimizations. It was published at about 5:15am from my motel room in St. Pete Beach. I am meeting repeat client Bill Eaton at DeSoto early this morning. And then drive back to ILE. This image was created pre-dawn on the clear morning of October 20, 2014 at Fort DeSoto Park. I used the Gitzo 3532 LS carbon fiber tripod, the Mongoose M3.6 head, with the Canon EF 600mm f/4L IS II USM lens and a beta version of the Canon EOS 7D Mark II . ISO 500 (via ISO Safety Shift). Evaluative metering +1 stop as framed: 1/15 sec. at f/4 in Tv mode. Color temperature: 8000K. Central Zone AF/AI Servo/Rear Focus AF activated two sensors in near the lower right of the grid that were active at the moment of exposure. Click here to see the latest version of the Rear Focus Tutorial. Click on the image to see a larger version. With somewhat blah sky colors it can be fun to raise the Color Temperature. I did that with the image above by setting it to 8000 Kelvin. Anywhere from 7500 and up can work well. I used my standard blur set-up: 1/15 sec at +1 stop of exposure compensation. And yes, you can do the same thing in post processing but it is more fun to do it in the field and there are supposed to be some advantages of doing it at the time of capture. I did remove a single bird that merged with two others; I used a series of Quick Masks that were refined by adding Regular Layer Masks. This image was created in the shade of a big stand of trees on the clear morning of October 20, 2014 at Fort DeSoto Park. I used the hand held Canon EF 300mm f/2.8L IS II USM lens and a beta version of the Canon EOS 7D Mark II . ISO 640 (via ISO Safety Shift). Evaluative metering +2 stops as framed: 1/1000 sec. at f/2.8 in Tv mode. AWB. Central Sensor/AI Servo Surround/Rear Focus AF on the bend of the bird’s upper neck was active at the moment of exposure. Click here to see the latest version of the Rear Focus Tutorial. Click on the image to see a larger version. Well, at least the fish angle is perfect. I tried my best but could just not get ahead of the bird but it kept angling ahead of me…. This image was created on the clear morning of October 20, 2014 at Fort DeSoto Park. Again I used the hand held Canon EF 300mm f/2.8L IS II USM lens and a beta version of the Canon EOS 7D Mark II . ISO 400. Evaluative metering +1/3 stop off the sky: 1/6400 sec. at f/5 in Manual mode. AWB. Central Sensor/AI Servo Surround/Rear Focus AF barely caught the top of the tern’s head as originally framed and was active at the moment of exposure. Click here to see the latest version of the Rear Focus Tutorial. Click on the image to see a larger version. The tide was coming in at the spit. 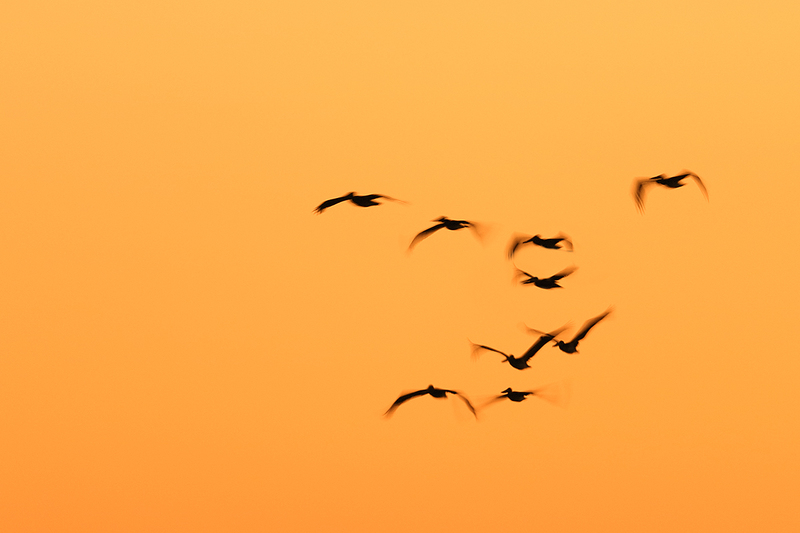 I had been trying for flight with the 300 II/1.4X III/7D II combo for a while without much success. To change things up I took off the TC and got closer. Then I got lucky. This image was created on the clear morning of October 20, 2014 at Fort DeSoto Park. Again I used the hand held Canon EF 300mm f/2.8L IS II USM lens, with the Canon Extender EF 2X III, and a beta version of the Canon EOS 7D Mark II . ISO 400. Evaluative metering at zero: 1/1600 sec. at f/8 in Av mode. AWB. Upper Central Zone/AI Servo/Rear Focus AF selected four sensors, the one just above the central sensor and the three directly above that one. This array nailed the eye and the face and was active at the moment of exposure. Click here to see the latest version of the Rear Focus Tutorial. Click on the image to see a larger version. When a Green Heron flew by the spit and disappeared to the east I said to a new acquaintance, “Good luck photographing that species here. 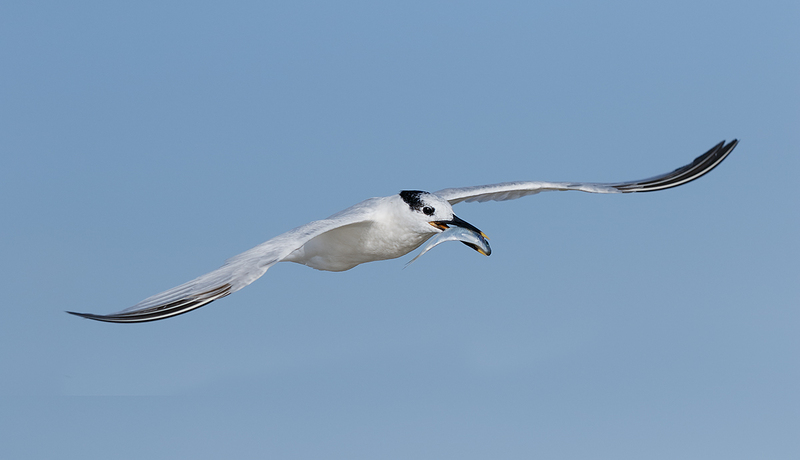 I am not ever sure that I have seen one in the park before.” In a few minutes I took a walk down the beach and was amazed to see the bird in the Gulf. As I approached, the bird flew but it went only a short distance and landed on tree stump with the top sawed off. In other words, not very attractive. I added the 2X III TC to the mix to eliminate the stump and got as close as possible. I am starting to figure out when and how to use the new wider Zone AF. Which is the best image? Please take a moment to leave a comment and let us now which is your favorite and why you like it. Good morning Guru. Hope this post finds you in good health and as cheerful as ever. 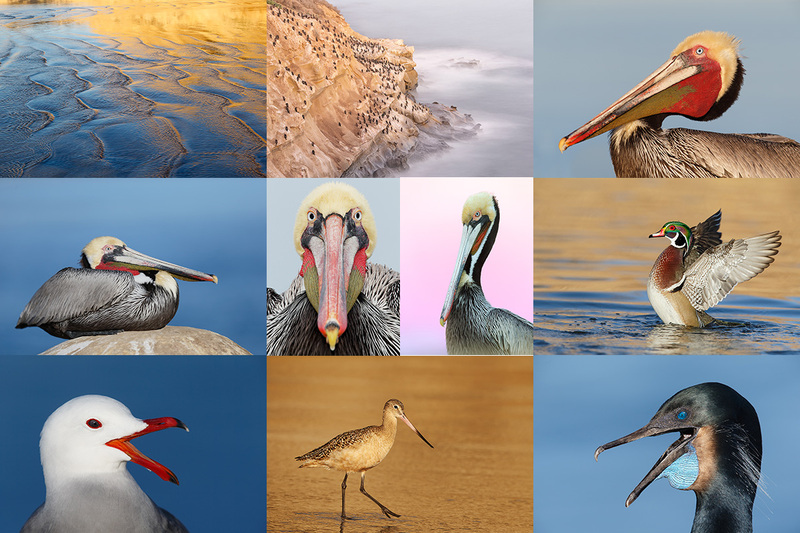 Perhaps mistakenly, I’m observing most of your great bird photos are of Waders and Shore Birds. Don’t remember having seen many images of Passerine Birds (such as Starlings, Jays, Finches, Hornbills, Nuthatches, Flycatchers etc.) shot by you. May I know the thread or site where I can find them? But alas, while I used to do lots of songbirds when I used film and lived in new York, I have not done a lot of songbirds in the last decade so you will not find a songbird gallery at the link above. 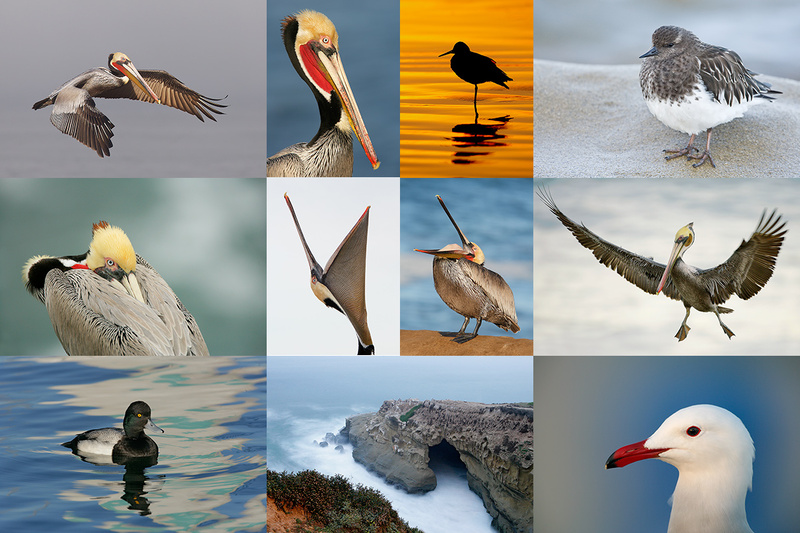 ps: over the years you will find some images of passerines on the blog: Scrub Jays in Florida and Darwin’s Finches in the Galapagos come to mind…. Agreed Artie. We try to capture these birds but the senior group (me included) is obviously not that lucky and fit enough for the challenge. However, fortunately we have a young birders group just graduated from universities, that are continually exploring the forests with hardship and finding out species some of which were previously unknown to us. With those findings the nature watchers and conservation activists are painstakingly endeavoring to raise awareness among common rural people to save our ecosystem. Now, I like all the images but the green heron is my favorite. Very sharp and with great eye contact. Now I have a question: did you use fill flash on that one? I ask as it looks a tad over flashed to my eye. All in all a great set of images. The new 7D rocks! Thanks JC. I rarely use flash anymore and did not use it for any of today’s images. I use my NIK 50/50 or 25/25 recipes in place of flash. I think that I overdid the NIK and possibly saturated it a bit too much…. It might look over-flashed to you because the 7D II images are so sharp! My favorite is the Heron with the needle fish. The high key background really sets off the bird! Some wonderful images Artie. Particularly the first one packs great aesthetic appeal. Guru, did u do shooting by ‘stacking’ of extenders? If so, may we see some samples? As I launched a search on the subject; your thread came up to my pleasant surprise. It was amusing to learn the two extenders couldn’t be paired with each other and you had to bridge the missing link with an extension tube! The world is a beauty. Hi, Artie. Wonderful images. 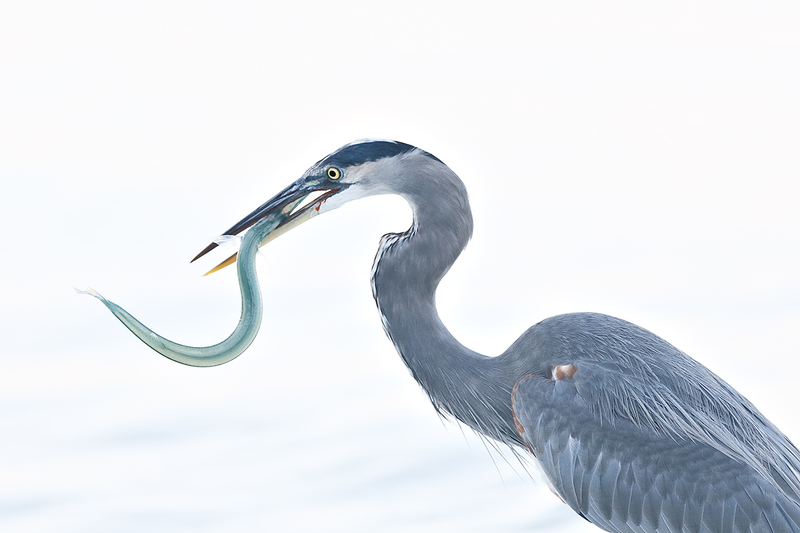 I’m pretty confident that your GBH is eating a needlefish (or possibly a very young houndfish, a very close relative; an adult houndfish would be as likely to eat a GBH as vice versa!). For me, a perfect angle on the fish would show its head clearly! 🙂 But that dorsal fin and tail say “needlefish” pretty clearly; I can’t think of or find anything else like that. 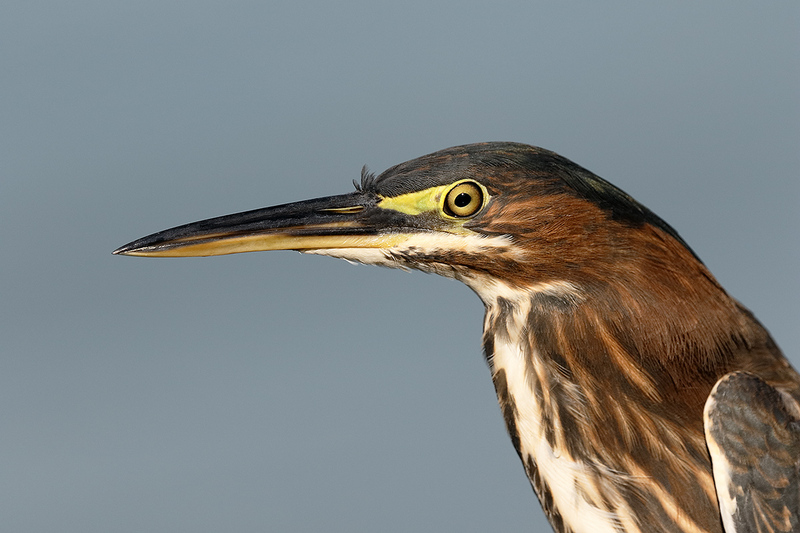 My favorite is the green heron for its incredible sharpness and color and composition. I have Hugh Metcalfe’s question as well. Any reason why the 300 f/2.8 IS II + 1.4x/7D Mark II wasn’t working out for flight shots? This is a combo I’d love to try when I get the Mark II. The birds were too close :). I fully expect that combo to be superb for flight photography but remember that with the lens alone you will be at equivalent 480mm. 672 with the 1.4X III in place…. Please use our link to purchase you 7D II. That’s a great excuse 🙂 Thanks, Artie! On your Great Blue Heron picture you described the use of ISO Safety Shift. Do you keep this option always enabled? I’ve never used it before. Thanks for you time and efforts! I keep ISO safety shift enabled on all of my bodies that offer this feature. It’s use is detailed in several of our camera User’s and AF Guides. Learn more about those here. ps: you are most welcome.